Ah, Twitter. What would football fans do without the social media site when they look for banter at its finest? A lot can happen over 140 characters and more often than not it involves people taking out their frustration on clubs, players and even football managers. But therein lies the problem. Most casual users on Twitter don’t tag the right people and end up tweeting the wrong person – a simple case of mistake identity because they share the same name, nickname or initials. We list a few people who always end up being targeted as a result. Poor Chelsea. No, not the club. This designer from New York who has the handle @chelsea on Twitter. She probably gets a lot of hate tweets from fans who despise the club and then a few more from Chelsea fans when the team performs poorly. 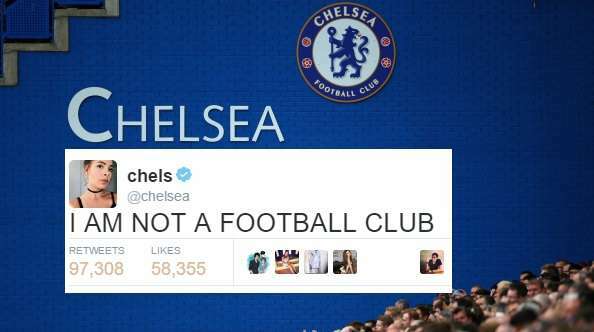 For those wondering, the club’s official account is @chelseafc. Of course, many users still send tweets to @chelsea regardless. @chelsea I lost my wallet during the match against Villa. Whom should I contact? Fun fact this is the first time your manager has lost consecutive games in 7 years @chelsea and he did it at the emirates!! #GoGunners!!!!! !